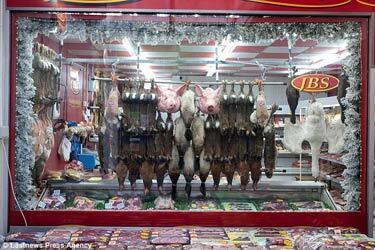 A high Street butcher in Suffolk has been forced to take down its window display, as shoppers are said to be offended by the sight of bits of dead animals. Hanging pigs’ heads, limp rabbits and dead pheasants were upsetting the children. This kind of urban deracination has real consequences. People who think that meat is manufactured somewhere in a factory laboratory look upon all animals as lovable Disney characters and are eager to ban hunting and all the other field sports. Meanwhile, demand for antiseptic and completely uniform food items makes old-fashioned family farming and human animal husbandry impossible and meat animals are that much more certain to be raised in unnatural factory farm hatcheries. Human ignorance and alienation from Nature and the countryside is bad for agriculture, bad for animals, bad for the countryside, and impoverishing to human culture. 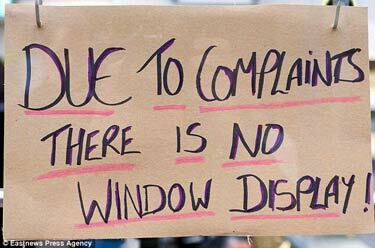 One Feedback on "UK Butcher Shop Forced to take Down Window Display"